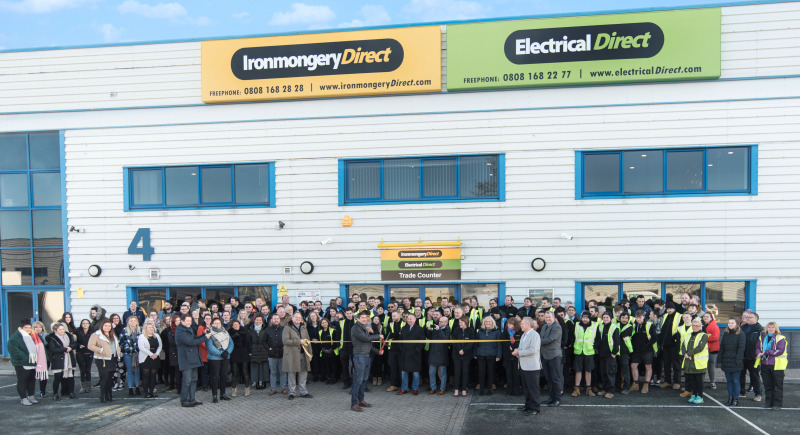 The Manutan European Group, which owns Ironmongery Direct and sister company Electrical Direct has completed a major expansion project – doubling the size of its warehouse, in order to house thousands more new product, and expanding its call centre space - to continue to drive growth across the business. A new 100,000sq ft warehouse, which is the equivalent of two football pitches, will now house more than 30,000 products for both Ironmongery Direct and its co-brand Electrical Direct – all of which are available for next-day delivery. The new facilities will also have 2,000 pallet storage locations. Manutan Traders Division managing director Wayne Lysaght-Mason said of the expansion: “We took the decision to double the size of our warehouse in order to continue our 20% year on year growth, cement our market leading proposition and drive ambitious range extension. Whilst giving our sister brand Electrical Direct a strong base for growth. The new warehouse officially opened on Thursday, January 17 by Manutan Group CEO Xavier Guichard and Wayne Lysaght-Mason. They were also joined by the rest of the Manutan Group management board, along with over 200 staff to celebrate this significant landmark. The expansion also allows the organisation to bring in the fulfilment of Electrical Direct orders under one roof, enabling the service and product range to be greatly improved. In 2019 Ironmongery Direct marks its 50 year of trading. The business began life as a traditional ironmongers, and now its customers can browse more than 17,500 products in the catalogue and online.